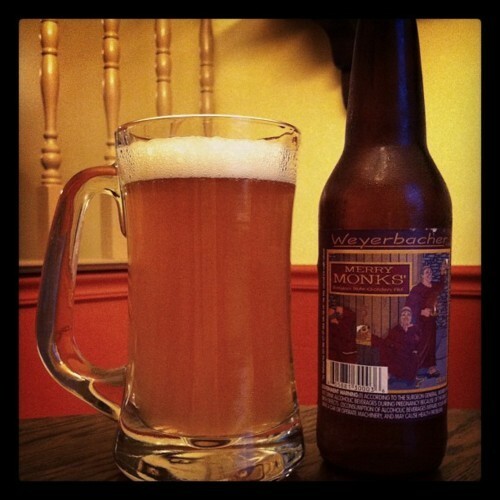 Merry Monks’ Ale is a Belgian style Tripel brewed by Weyerbacher Brewery, located in Easton, Pennsylvania. Founded in 1995 by husband/wife Dan and Sue Weirback, the original idea came to the pair as they vacationed in Vermont in 1993. While there, they toured a small brewery ran out of the basement of an old mill; Dan, who was an avid homebrewer at that time, started to think maybe the beer business was calling his name. 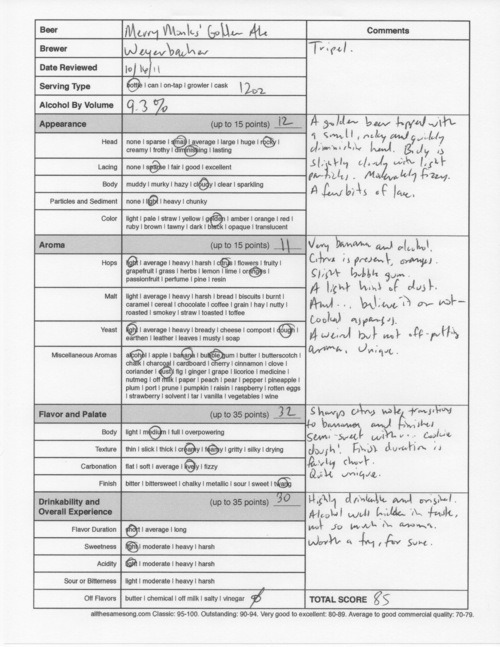 Upon opening, the brewery took what they admittedly considered a wrong step: they tried to primarily brew mainstream beers using very common styles, like Pale Ale or Extra Strong Bitter, completely eschewing creativity. It took two years for Weyerbacher to really knock people off their feet with a Raspberry Imperial Stout, a recipe crafted by Dan and considered an extreme brew. This was a beer that stood out and finally people took notice — the company decided to change direction and only make full-flavored, high quality beers for discerning customers. Merry Monks’ Ale has been part of the success for Weyerbacher, which now occupies a 20,000 square foot manufacturing facility — a huge expansion from Dan Weirback’s basement. Merry Monks’ is bottle conditioned, meaning sugar and yeast are added in just prior to bottling. The company says this gives the drink a “special effervescence” as well as increasing its shelf life. The traditional Belgian Tripel is prized for its complexity and the dubious flavor-absent alcohol content — Merry Monks’ weighs in at 9.3% ABV (alcohol by volume). The twelve ounce bottle unleashed a dull, golden beer with a small, rocky and quickly diminishing head. The body was slightly cloudy with fine particles floating throughout. The liquid was moderately fizzy and left a few bits of lace here and there as I drank. Here’s where things get a bit weird. In the aromatics department, right off you notice a heavy presence of banana and alcohol. It’s creamy banana — if you’ve ever had a banana popsicle, you’ll know this smell. It’s sweet and creamy banana, which is pleasant; but it gets strange when you pick up the background notes of baked asparagus. Yes, you read that correctly… baked asparagus. It’s not off-putting, but it’s certainly quite unique and something I’ve never inhaled before. There are slight notes of bubble gum and dust, and a good amount of orange present. Onto the flavor. Right away, you get a sharp, deep citrus note, which turns spicy and shows a bit of clove. Then Merry Monks’ transitions into the banana and finishes with… wait for it… COOKIE DOUGH. Yes, that’s correct, another thing you are not misreading. Cookie dough. It’s faint but it lasts longer than a couple of seconds, and I’m very sure its there. The finish is short but warms the throat with alcohol. Mouthfeel was creamy and frothy, matching the creamy banana aromatic. Merry Monks’ Ale is highly drinkable and I found it to be outstandingly original. The alcohol was well hidden and the unusual aromas and flavors were never a negative. I recommend you try this one — if you don’t like it, I think you’ll at least appreciate the approach into new territory. 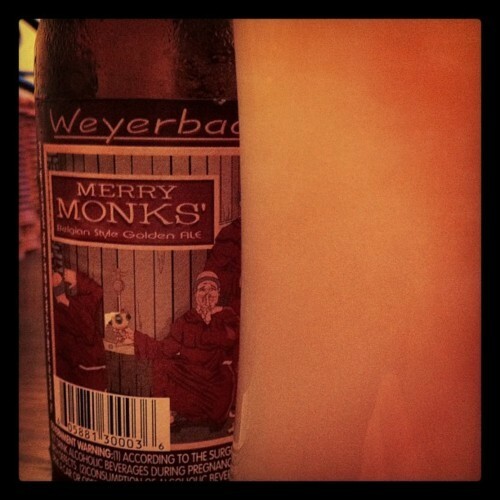 Weyerbacher Merry Monks’ Ale, 85 points. Price: $2.49 US for one twelve ounce bottle.